Bears Buddy Box! 24 bags, your choice! Shipping Included! Our Products >> Bears Buddy Box! 20 bags, your choice! Shipping Included! P.S. 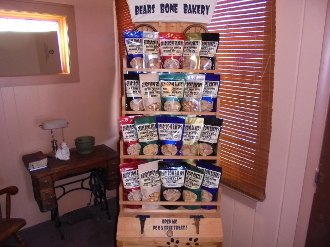 Select your treats by adding them tto the comment section of your order, OR Bear can send you his favorites! 7 Mini peaut butter , 7 Variety, 2 Bacon, 2 Cranberry and 2 Cheddar. Bears Buddy Box! 20 bags, your choice! Shipping Included! Copyright © 2014-2019 Bears Bone Bakery. All rights reserved.